"Creamy Brie cheese and salty prosciutto transform ordinary grilled chicken breasts into an indulgent, company-worthy dish. For entertaining ease, stuff the chickens up to one day in advance; reserve in the refrigerator until 30 minutes before grilling." Preheat the grill to medium-high. Cut the cheese into 6 equal portions. Top each piece of cheese with two sage leaves and wrap with a slice of ham. 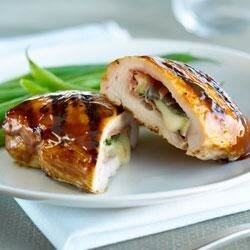 Place each cheese bundle on one side of a butterflied chicken breast. Fold the chicken over to enclose the filling and secure closed with toothpicks. Sprinkle evenly with salt and pepper. Chop the remaining sage. Stir the ketchup with the balsamic vinegar, maple syrup, mustard, garlic and chopped sage until combined. Divide glaze in half. Brush one portion over the chicken. Place the chicken on the grill and reduce the temperature to medium. Grill the chicken for 6 minutes; turn and baste with the remaining sauce. Grill for an additional 10 minutes, or until an instant read thermometer inserted into the thickest portion of meat registers 165 degrees F (74 degrees C). Remove from grill, tent with foil and let rest for 5 minutes. Slice meat thickly and fan to serve. Twist 1: For a cheese alternative, try sliced Mozzarella, Oka or Cheddar cheese instead of the Brie. Twist 2: For an herbal twist, use fresh basil instead of sage. Twist 3: For an elegant supper, serve with rice pilaf and steamed green beans. Twist 4: For grilling indoors, use a foil pan to tent the meat and allow it to cook more evenly. The sage is overpowering. Would recommend using way less. This was delicious! I did make it in the oven at 400 degrees for 20 minutes. There are only two of us, so this made enough for dinner and two lunches. LOVED the glaze! No changes, it was great just as it was!